Germany’s Oktoberfest kicks off on Saturday, September 20 and for those San Diegans who can’t make the 6,000 mile trip to Munich, Germany, Tin Roof has you covered! Join in on the Oktoberfest celebration with the Samuel Adams Stein Hoisting Competition, a tradition known as masskrugstemmen. 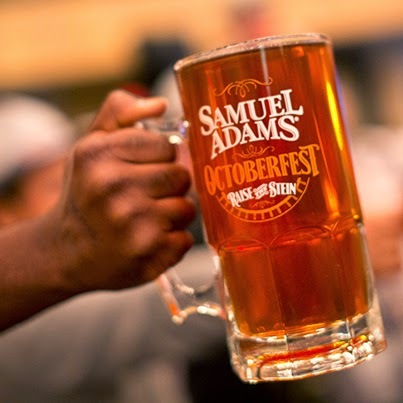 Beginning at 7pm on September 20th, participants will fill their 1-Liter Stein with Samuel Adams seasonal Octoberfest brew and then the countdown begins! The rules are simple - Hold the stein at arm’s length for as long as possible, spill the beer or bend your arm and you’re out. All participants will receive a t-shirt for entering and the winner will take home an authentic ceramic Samuel Adams stein (pictured below). For those that don’t want to work for their beer, pints of Samuel Adams will be available for $5 all night. From 8-10pm, every Samuel Adams Octoberfest purchase will come with a complimentary branded Samuel Adams pint glass while supplies last. Masskrugstemmen is a Bavarian feat of strength and endurance where contestants hold a 1-liter stein of beer (which weighs about 5 pounds) out in front of them at shoulder level for as long as they can. No beer can be spilled, no elbows can be bent and extended arms must be kept parallel to the ground. The German word ‘masskrug’ translates into a one-liter stein of beer and ’stemmen’ means ‘lift.’ When put together, it’s a very accurate description of the competition! Prost! Tin Roof is located at 401 G St. in downtown San Diego. For more information, visit tinroofbars.com/Home/SanDiego.